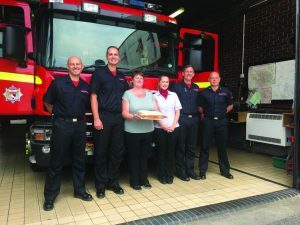 A Norwich resident has been delivering cakes to the county’s fire service to say thank you for their dedication to the job. Linda Cullum lives in Markham Tower, which suffered extensive damage during a blaze in 2011 that was attended by 80 firefighters. Her gift comes after fire service staff spent the weekend visiting residents of high rise blocks in Norfolk to chat through any concerns about fire safety in light of the London fire. Linda, who works at Tesco in Drayton, made cakes in the bakery there on Wednesday morning iced with thank you messages, and delivered them to Green Watch crews at Earlham and Sprowston at lunchtime. Linda’s flat was heavily water damaged in the 2011 fire and she lived in a hotel for 13 weeks. Norfolk Fire and Rescue Service’s Assistant Chief Fire Officer Les Britzman said: “We appreciate the thought and the show of support for the service from Linda. This entry was posted in Drayton & Taverham, Home Page, Sprowston and tagged Drayton, Norfolk firefighters, Sprowston on June 21, 2017 by Gay Webster.